Applesauce is usually a decent replacement for all or part of the oil in quick breads, and apple butter can be too. In Double Chocolate Apple Butter Bread, a combination of apple butter and vegetable oil keeps this bread moist and adds just a tiny hint of apple flavor. 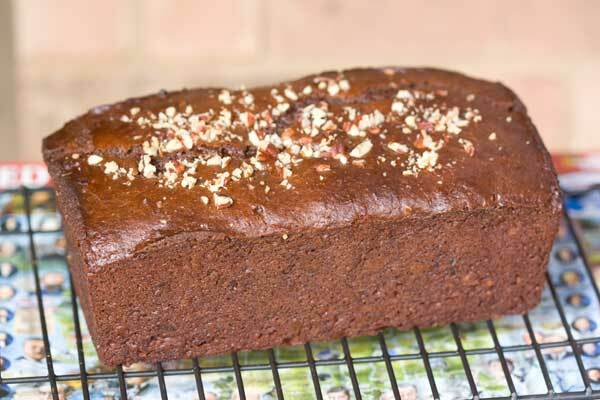 Spices are optional in this bread, which is truly more of a quick bread than just a cake in disguise. I left out cinnamon and allspice in favor of a clear chocolate flavor, though the spices would not be a bad thing. The chocolate chips, in my opinion, are not optional. Even though the bread is sweet, the extra sweetness from the chocolate chips makes a good thing better. Preheat oven to 350 degrees F. Spray a 9x5 inch or 8 ½ x 4 ½ inch metal loaf pan with flour-added baking spray. Mix the flour, cocoa powder, baking powder, baking soda, salt and salt together in a bowl and set aside. In a large mixing bowl, whisk the apple butter, oil and sugar together until smooth. Add the eggs one by one, then whisk in the vanilla and the yogurt until smooth. Whisk in the flour, then stir in the chocolate chips. Scrape batter into the loaf pan and sprinkle nuts across the top. Bake on center rack for 50 to 60 minutes or until a pick inserted in the center comes out clean. Let cool in the pan for about an hour, then remove from pan and let cool completely before serving. My favorite loaf pan is an 8 1/2 x 4 1/2 loaf pan, and it's what I used for this bread. It worked well, but I think next time I'd do it in a 9x5 inch loaf pan. If you use a 9x5 inch loaf pan, the bread will probably be done in 45 or 50 minutes. If you put all the batter in the smaller sized loaf pan (like I did), it will probably take an hour. If your oven runs hot and you know it, you might want to bake this at 325 until done. Wow, I think I’ve only tried pumpkin butter once, but I can imagine it would work beautifully in this. Thanks for the review! Made this last night using pumpkin butter from Trader Joe’s. So tasty! Mmm, that looks good. Last year I made some apple butter. That would be fun to try this bread.